Okay so she didn’t walk, she was transported, and it wasn’t to a bar. 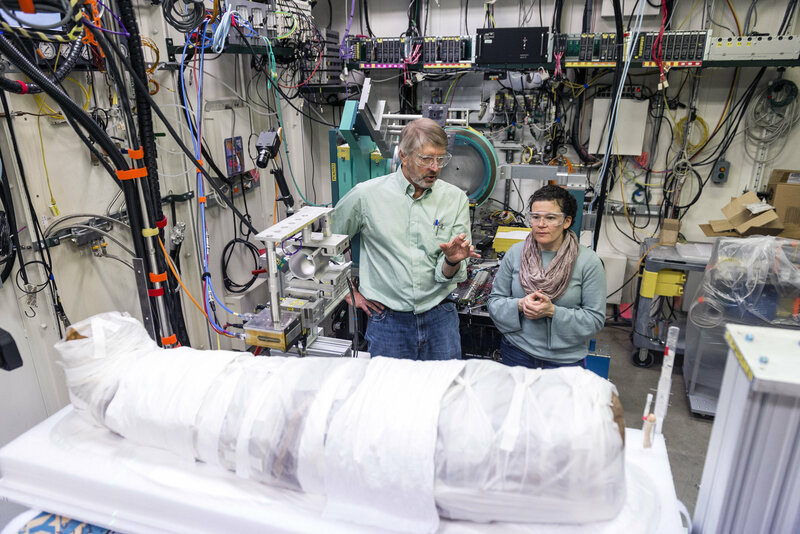 It was to the Advanced Photon Source at Argonne National Laboratory where the first time ever, a mummy was scanned by a particle accelerator. The mummy was donated years ago to the Garrett-Evangelical Theological Seminary at Northwestern University by the Hibbard family, wealthy patrons who had funded archaeological digs in Egypt in the early 20th century and received the mummy as a gift (goes the story). 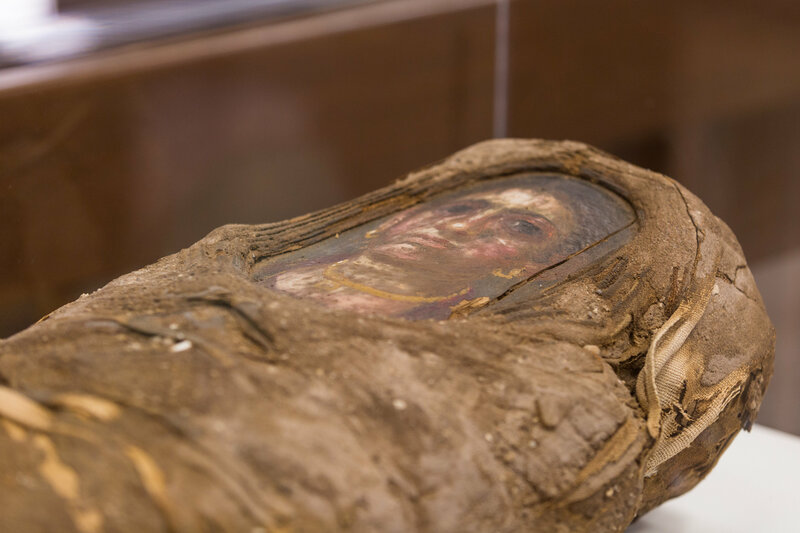 They gave this mummy, the remains of a little girl just five years old at the time of her death in the late 1st century A.D., with a portrait of her over her face as if she were peering through the bandages wrapped around her body. It’s that portrait that captured researcher’s interest. The encaustic-on-wood panel paintings preserved in pristine color and detail by the dry desert heat of Egypt are so personal, evocative and haunting that they’ve been a hot-ticket item for wide sale and distribution in the shady antiquities trade since the first ones were found in the 17th century. Today the mummy portraits number about 900, most of them unearthed from the Faiyum necropolis southwest of Cairo, as was the little girl whose remains were discovered in Hawara at the entrance to the Faiyum oasis. The Faiyum portraits are the largest assemblage of ancient panel paintings still in existence today. Only 100 of them are still intact and attached to the mummies they depict so expertly. The Hibbard mummy is part of an elite cadre, therefore. And yet, nobody in the archaeological department or on the staff of Northwestern’s Block Museum of Art had any idea she existed. She just hung out at the Seminary for a century, uncommented upon, until museum curator Essi Rönkkö saw her in person. With the curatorial team already in the process of collecting mummy portraits for an upcoming exhibition Paint the Eyes Softer: Mummy Portraits from Roman Egypt (ie, Faiyum), Rönkkö took advantage of the unbelievably rare opportunity to add the girl’s mummy to the portraits going on display. The child’s body is wrapped tightly in thick layers of linen wrappings, the outer layer of which cross each other in a painstaking geometric arrangement that secure and frame her painted visage. Painted with pigment and sealed with beeswax, the girl is shown with her hair is tied at the nape of her neck and wearing a red tunic with gold jewelry. Because of her secure bindings, there was no way for researchers to study her insides without causing damage, but now that they had a real matched pair, the bones still safely wrapped in their original bandages and the intact portrait above them, researchers wanted to examine both the human and her representation with the best technology at their disposal. In August they took the mummy to Northwestern Memorial Hospital where she was given a CT scan. 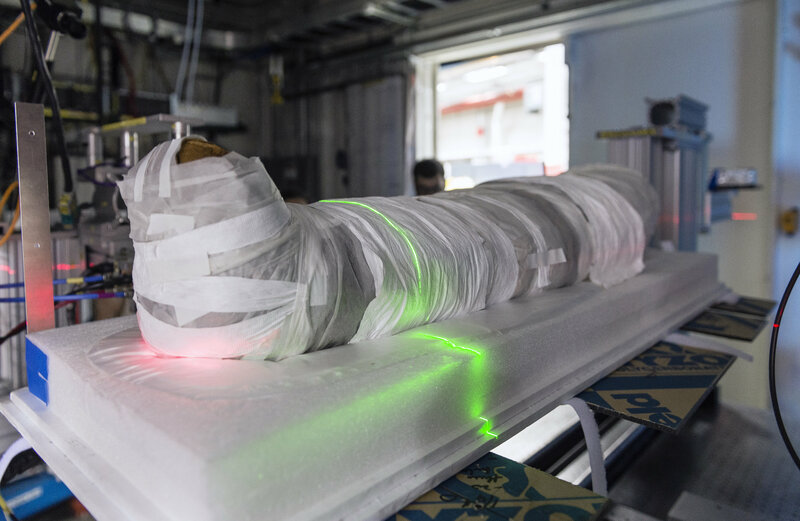 This provided the team with a 3D map of the mummy’s inside and confirmed she was about five years old when she died. On Monday they considerably upped the ante and took her to the Argonne National Laboratory in Evanston to see what the immense light power of X-ray scattering (the technology that revealed the contents of that medallion box from the French crypt so clearly I heard my own jaw drop when I first saw the video) could tell us about her. Paint the Eyes Softer: Mummy Portraits from Roman Egypt opens at the Block Museum of Art on January 13th and runs through April 22nd, 2018. Archaeologists have unearthed another piece of colossal scenary from Cecil B. DeMille’s 1923 epic silent movie The Ten Commandments from the sands of the Guadalupe-Nipomo Dunes near Pismo Beach, California. At least one filmmaker, enthusiasts, nature conservancy advocates and archaeologists have been looking for the fabled set since 1982. DeMille claimed to have deliberately destroyed it after filming wrapped to keep it from being used by copy-cats to get their movies to look as good as his without having to spend the Croesonian budgets studios allowed him. He said he had it dynamited to smithereens and bulldozed the remains into a trench. A few bits and pieces were indeed found by filmmaker Peter Brosnan in 1983, who had to do assiduous research to even find the general area where this landmark film was shot. While there was a small flurry of interest from the Hollywood community when the first discoveries were made, the next shiny thing came along to distract potential moneyed supporters and Brosnan spent the next 30 years looking for more of the set and trying to raise funds to finish a documentary about the search that he’d been filming since 1982. In 1998, Brosnan’s organization teamed up with a nature preserve advocacy now known as the Guadalupe-Nipomo Dunes Center and together they were able to recover more pieces of the set. DeMille had not in fact dynamited it, it seemed. There would have been evidence of that in the fragments, damage, scatter pattern, etc. He just broke the whole thing down and buried it and then the harsh elements did the rest, turning all that plaster and balsa wood to dust. Leave it to him to spin a yarn featuring a big dramatic action sequence complete with pyrotechnics when describing striking a set. The pursuit of the fabled lost land of Fake Movie Egypt picked up steam in the second decade of the 21st century. An archaeological dig discovered the head of one of the 21 plaster sphinxes (originally each one was 12 feet tall and weighed five tons even though they were hollow) that DeMille used to line the dramatic corridor leading to the main gates of “The City of the Pharaoh,” a vista he borrowed from the Avenue of Sphinxes that connects the temples of Karnak and Luxor. 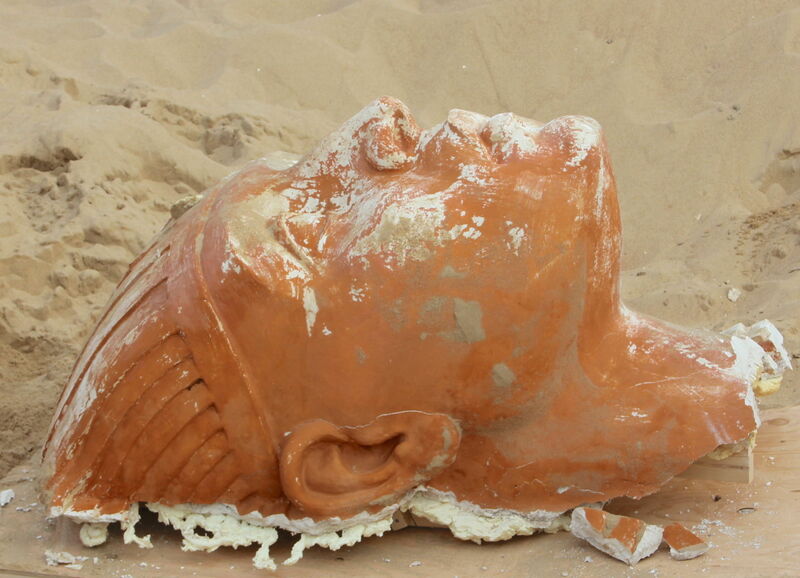 The archaeologists were not able to transport the head so they reburied it hoping the sands would preserve it, but the Guadalupe-Nipomo Dunes are not Luxor. They’re at the beach, after all, and there’s a saltwater marine layer that blocked the adhesion of the expoxy archaeologists had coated the plaster in for its protection. When they returned in 2014, the head had fallen to pieces. 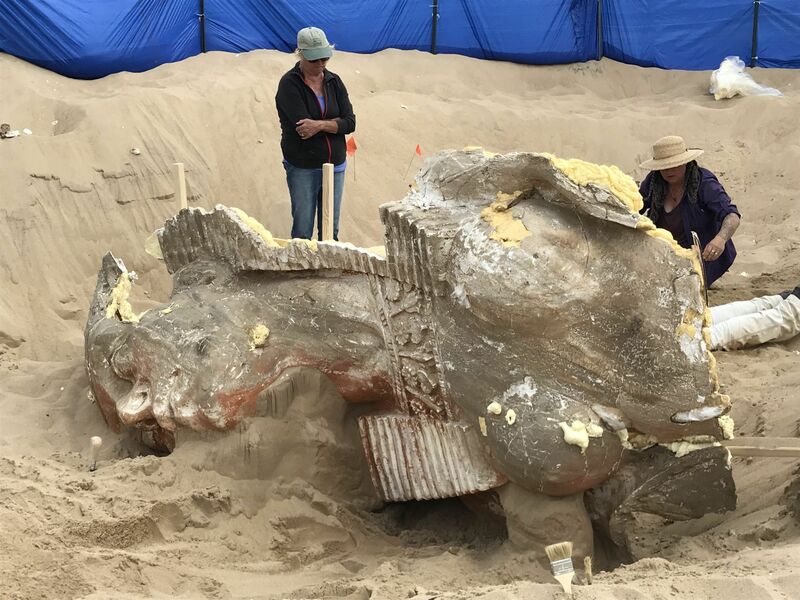 They were able to find another of the The City of the Pharaoh sphinx heads nearby that year, and that one was successfully recovered and conserved for display at the Guadalupe-Nipomo Dunes Center. In October of this year, archaeologists finally returned to the site. (Funding in an unending migraine, hence the irregular digs.) 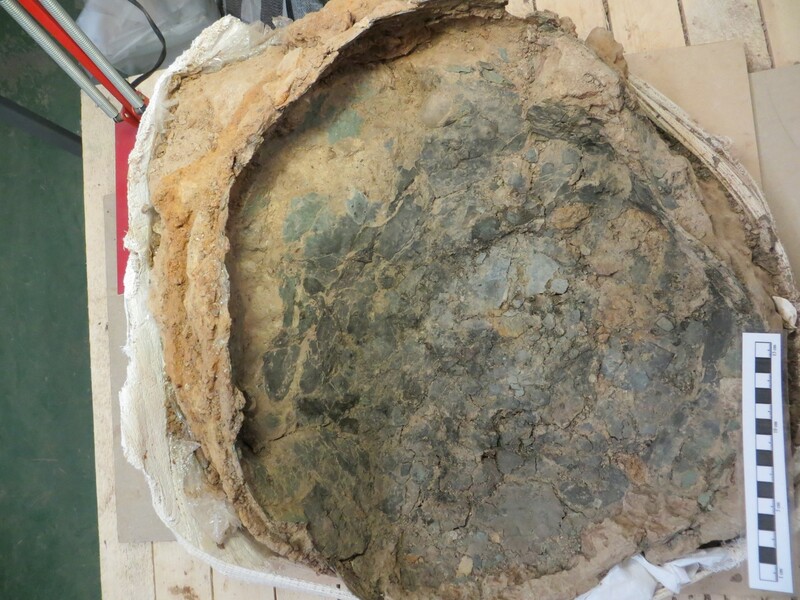 The excavation was very brief, from October 23rd through November 4th, but the team made a big find even in that brief window: a 300-pound piece of the head of another one of the plaster sphinxes, the largest and best preserved yet. 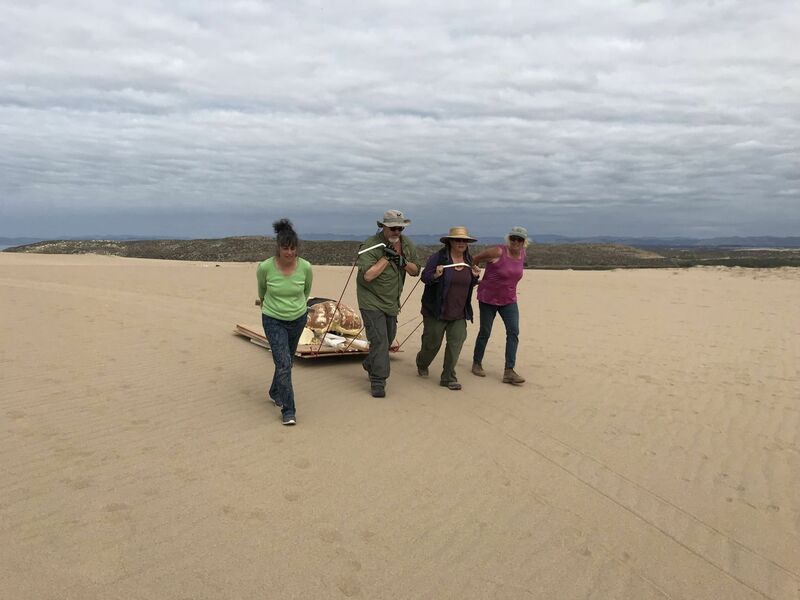 “The piece is unlike anything found on previous digs,” said Doug Jenzen, executive director of the Guadalupe-Nipomo Dunes Center. 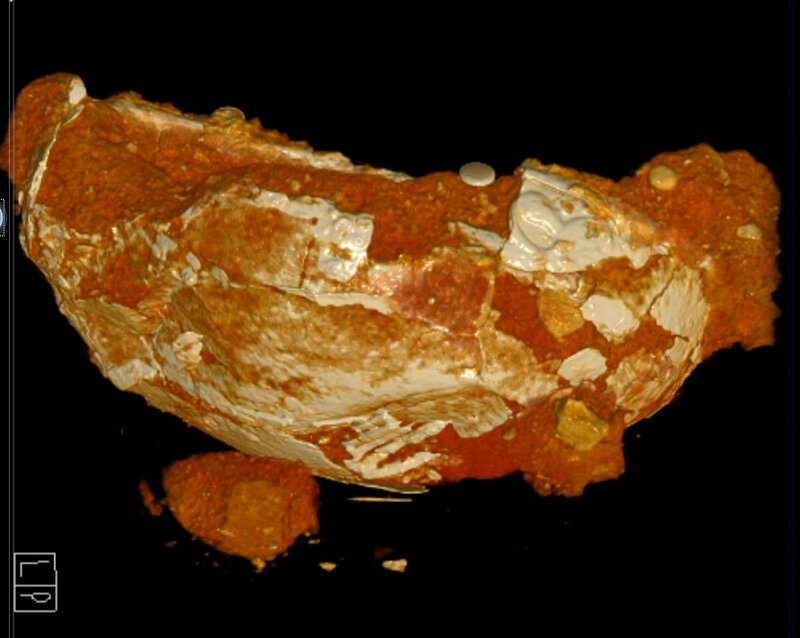 What makes the recent find significant is its size and how well-preserved researchers found it. The sphinx head, which is about 5 feet by 8 feet, is currently being stored so it can dry out for a few months before art restorers can get to work preserving the artifact. “It”s 94 years old and has been buried near the beach for that long; it is wet. If you think of the drywall in your house buried for 94 years at the beach, that is the consistency of the material we are working with,” Jenzen said. 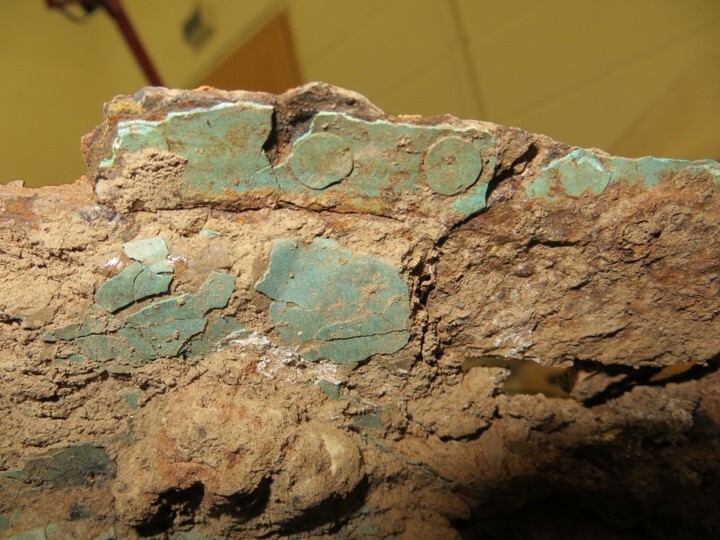 A team from the University of Leicester Archaeological Services (ULAS) has unearthed an unprecedented collection of Iron Age metal artifacts at Glenfield Park in Leicestershire. The excavation took place in the winter of 2013/2014 in advance of construction of a large-scale warehouse and distribution center on the site which was known to have had Iron Age remains from a small excavation in the 1990s and occasional discoveries after that by field walkers. What nobody knew was the size, extent and age of the Iron Age occupation. The team focused on a four-hectare area dense with features characteristic of an Iron Age settlement — roundhouses, enclosures, postholes, pits — located at the north end of the development site. The trenches dug by ULAS archaeologists revealed that the full size of the settlement was almost 12 hectares in area and was inhabited throughout the Iron Age and Roman era. 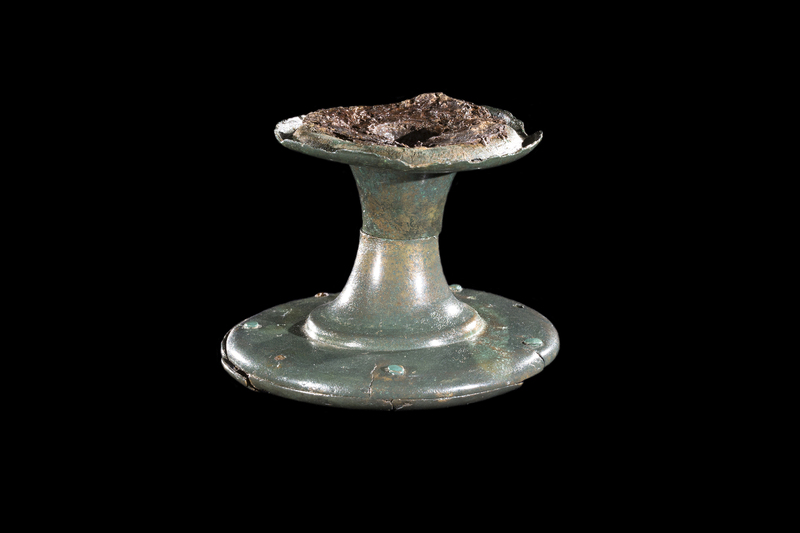 The ULAS team also unearthed metalwork, and lots of it: 11 metal cauldrons, either complete or all but, several ring-headed dress pins, an iron involuted brooch, a cast copper alloy horn-cap that may have been part of a ceremonial staff or mace. The cauldrons are the stand-out discovery. 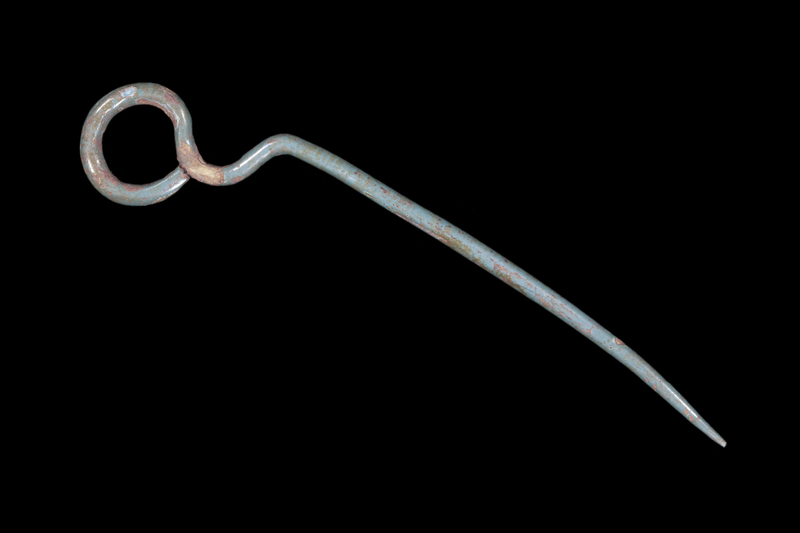 It is the only second multiple cauldron Iron Age find in Europe, the farthest north on mainland Britain and unique in the East Midlands area. The combination of metalwork is entirely unique; nothing of this range and variety has been found before. John [Thomas, director of the excavation and ULAS Project Officer] said: “Due to their large capacity it is thought that Iron Age cauldrons were reserved for special occasions and would have been important social objects, forming the centrepiece of major feasts, perhaps in association with large gatherings and events. Ritual depositions of objects used for ceremonial banquets appears to have been a common practice in Iron Age Britain and Europe, and the cauldrons would have been very important, very expensive, essential parts of the feast preparations which made them worthy candidates for deposition after the feasting was over. Because they were in such fragile condition, the cauldrons were not fully excavated in situ, but raised en bloc still encased in the soil in which they’d lain for thousands of years. 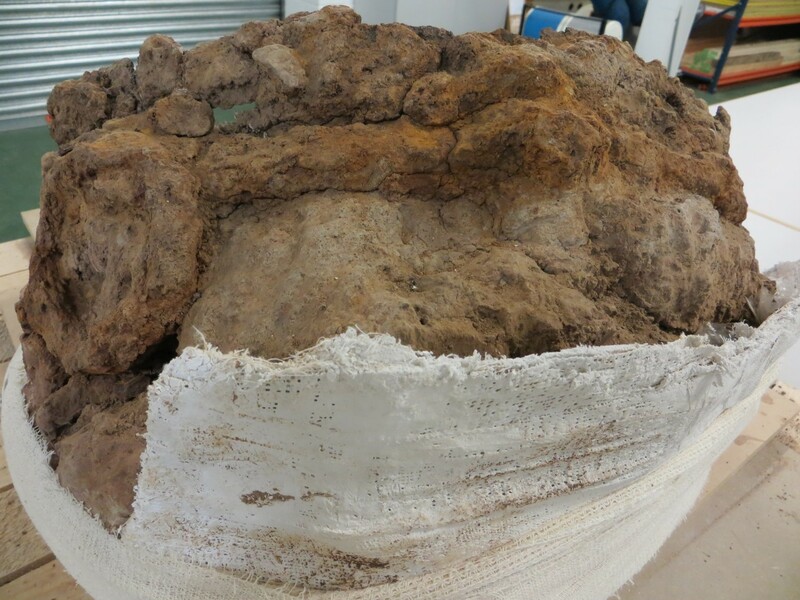 Before the painstaking excavation of the soil blocks in laboratory conditions could begin, the cauldrons were sent to the hospital, Paul Strickland Scanner Centre in Middlesex, which had CT scanners large enough to fit the massive metal-stuffed soil blocks. 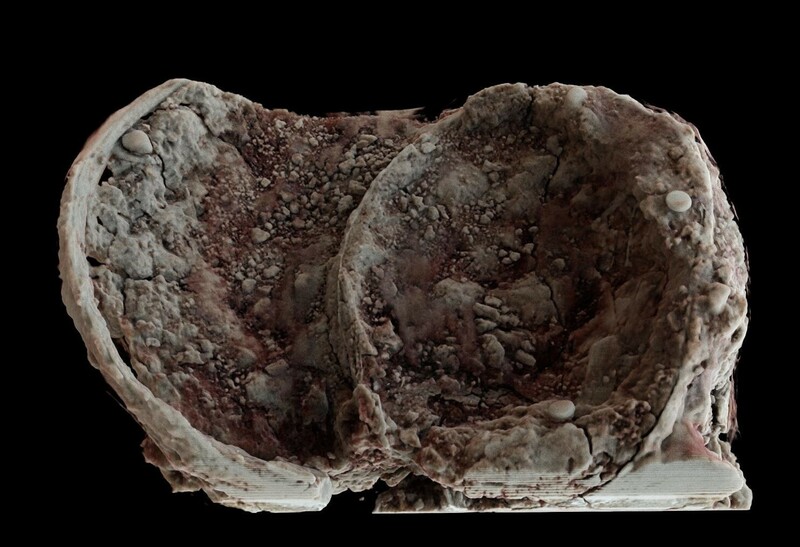 The scans gave archaeologists a roadmap to follow when excavating — the orientation of the cauldrons, their sizes, fragment placement — and a glimpse at even more exciting possibilities, namely evidence of decoration, something that is very rare on metalwork from this period. One of the complete cauldrons has a raised stem and leaf decoration on the iron band near the handle, a motif that is reminiscent of the “Vegetal Style” of Celtic art from around the 4th century B.C. 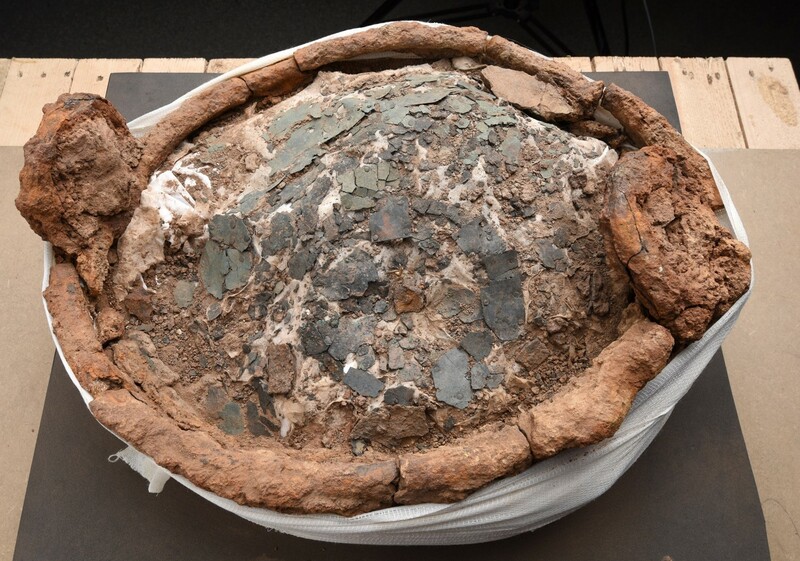 One of the smaller copper alloy bowls appears to have a domed rivet or raised boss decoration. Conservation and excavation of the cauldrons will be taking place at the Museum of London Archaeology (MOLA), and things are already looking promising. This video gives a brief overview of the site and the discoveries, including clips of the first cauldron’s CT scan. 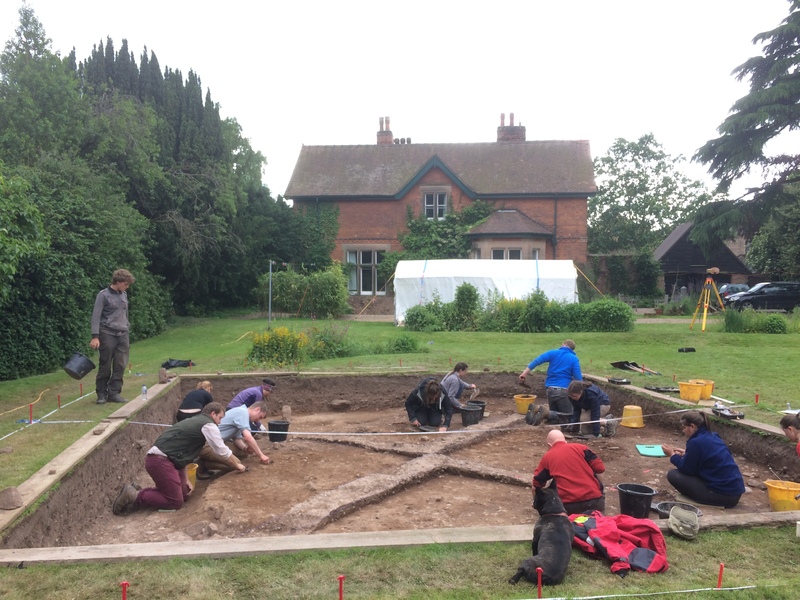 Archaeologists have unearthed weapons fragments, artifacts and the remains of workshops from a 9th century Viking camp next to St Wystan’s Church in Repton, Derbyshire. 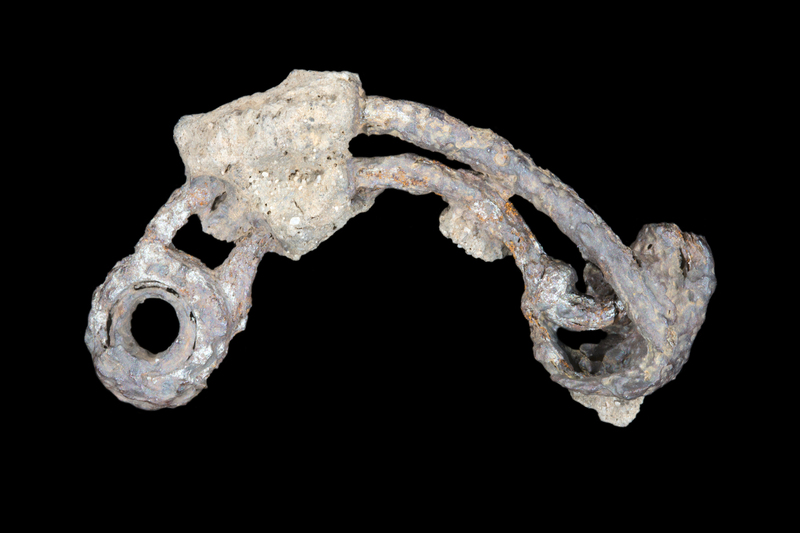 The University of Bristol team discovered the objects in the garden of the Vicarage adjacent to the church and were able to date by them precisely to the winter of 873-4, thanks to the application of cutting edge technology to retest bones from a mass grave found a few feet from the new dig site in the 1980s. Archaeologists had long suspected that there might be a Viking camp there because it’s in The Anglo-Saxon Chronicle: The Great Army “moved from Lindsey to Repton and there took winter quarters” in 873. They relieved the King of Mercia, Burghred, of his heavy crown and took his kingdom. They let him keep his head, at least; he was simply expelled from Mercia. A location on the River Trent seemed likely. River access is probably one the main reasons they moved to Repton and set up a camp for the winter in the first place; the presence of a large and wealthy monastery on the banks of the Trent that contained the tombs and mortal remains of several Mercian kings was another good incentive. In 1975, archaeologists excavating near the church on the banks of the Trent for the Viking camp site referred to in The Anglo-Saxon Chronicle thought they’d found what they had been seeking. They unearthed the remains of a medieval D-shaped enclosure built after the monastery. Dig co-leaders Professor Martin Biddle and Birthe Kjølbye-Biddle thought the enclosure and artifacts indicated this was indeed the Repton Viking Camp. The only problem was finding hard evidence of it. For a Viking camp, it was uncharacteristically tiny at about 1.5 hectares in surface area. Other Great Army camps are far larger, like the one at Torksey which is 26 hectares in area. Additional archaeological explorations of the site in the 1980s made another major discovery: a mound containing a mass charnel grave with the remains of more than 300 people. Researchers believed them to be Vikings killed in battle, but radiocarbon testing dated the remains in the 7th or 8th centuries, so at least a century too early to be part of the Great Army. In pursuit of fresh information regarding the size of the camp, University of Bristol doctoral candidate Cat Jarman and Professor Mark Horton of the University’s Department of Anthropology and Archaeology picked a location on the west side of the enclosure and just outside of the boundary to see if there were other structures or other evidence of Viking occupation. Geophysics, including ground penetrating radar, revealed structures including paths and possible temporary buildings. Excavations showed these to be gravel platforms that may have held ephemeral timber structures or tents with deposits including fragments of Saxon millstones and a cross fragment from the monastery. Associated were broken pieces of weaponry, including fragments of a battle-axes and arrows, and evidence for metal working. Also found were substantial numbers of nails, two of which had roves, the particular feature of Viking ship nails, as well as several lead gaming pieces. These are of a type that has been found in large numbers at the camp in Torksey and appear to be specifically connected to the early Viking armies. As significant as they are, artifacts and structural remains alone could not provide archaeologist with the date evidence they needed. It was the bones from the charnel mound, found a few yards north of the most recent excavation, that stepped up to the plate. It’s not the 1980s anymore, and radiocarbon dating technology is more advanced and precise today than it was then. It also requires far smaller samples. We also have stable isotope analysis now which allows researchers to determine from levels of certain isotopes in the teeth where a person was born and raised, what kind of food he or she ate and more. Jarman’s latest and greatest radiocarbon dating and isotope analysis results found that not only are the bones 9th century, but they died in the winter of 873-4, just when The Anglo-Saxon Chronicle the Vikings set up camp in Repton. 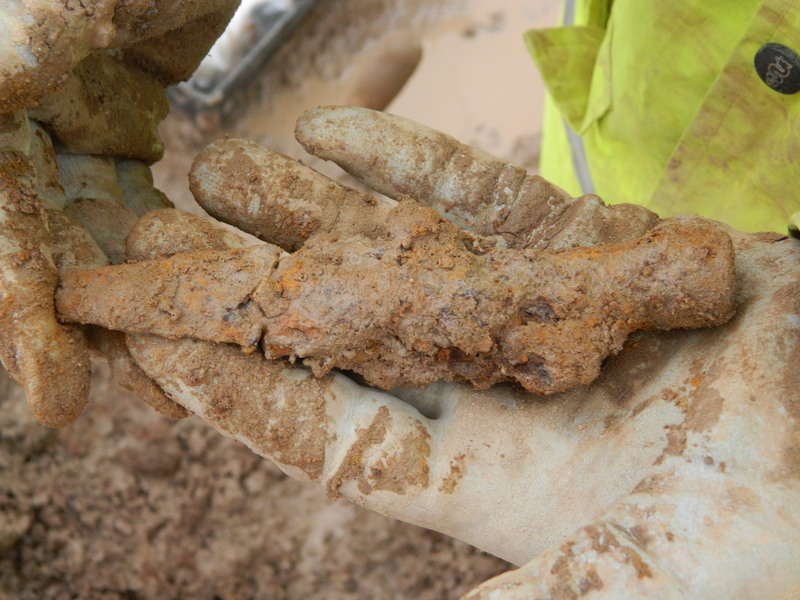 They also found a direct connection between the remains of the workshop and the charnel mound. The remains were placed in a deliberately damaged Saxon building along with Viking weapons and artefacts. The building also contained evidence of use as a workshop by the Vikings before it was converted into a charnel house. The Bristol team located a path linking their workshop area and the charnel house, further strengthening the link between the two. 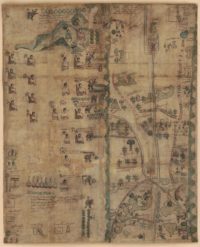 The Library of Congress has acquired an extremely rare manuscript map created by the Nahuatl people of Mexico in 1593. The Codex Quetzalecatzin, also known as the Mapa de Ecatepec-Huitziltepec, is one of very few manuscripts by indigenous Mesoamericans survive unburned, largely because it wasn’t part of the immense literary patrimony of pre-Hispanic cultures that was considered “demonic” because of its hieroglyphics, but rather the product of the Relaciones Geográficas, an extensive mapping project of colonial Spanish America ordered by King Philip II the late 16th century. Surveys sent to colonial authorities in every territory had to be filled in with a range of demographic, geographic, topographic and cartographic information, complete with an accurate and to-scale map of the area. The maps and much of the information on them were made by indigenous people based on local knowledge. 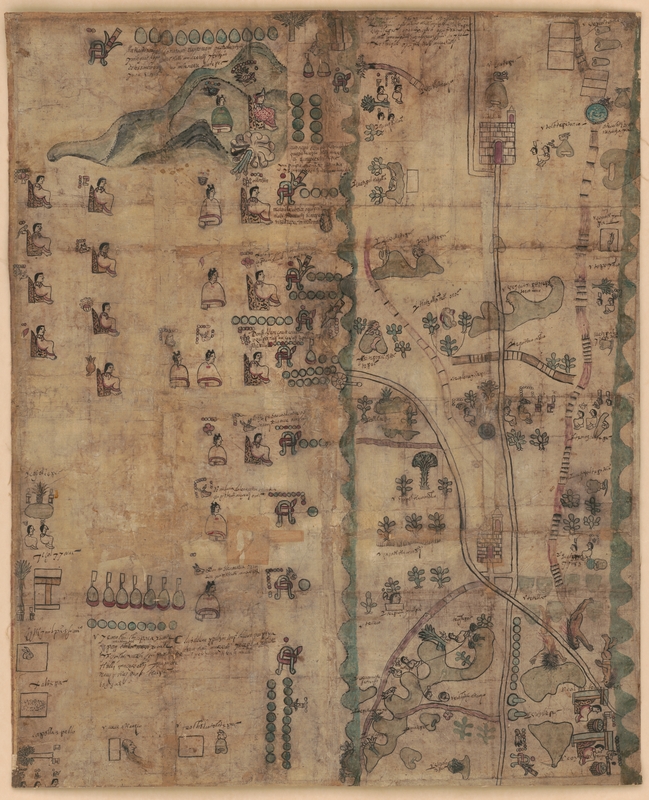 The codex maps southern Puebla from Ecatepec, today a suburb of Mexico City to the church of Santa Cruz Huitziltepec and across the provincial border into northern Oaxaca. It’s drawn in iron gall ink and painted in watercolors on paper. It is rich with hieroglyphics, colorful and compelling drawings and text labelling people and locations in Spanish and in romanized Nahuatl. While we don’t know the name of the artist/s and writers who made the Codex Quetzalecatzin, it does include unique geneaological information about an important local family — several generations of the Nahuatl “de Leon” family from 1480 through 1593 — and the interweaving of indigenous and Spanish cultures in the century after Christopher Columbus. The LoC has digitized the map and uploaded it to its website, which in case you haven’t seen it yet is one of the greatest photographic archives on the Internet and has been for years, long before other institutions got on the bandwagon of making high-resolution images available online to the general public. It’s so great, in fact, that I couldn’t even upload the full image to this article because it’s so gloriously gigantic my server can’t handle it. I mean, of course I uploaded a gigantic version, but it’s less than half the size of the original behemoth. Behold it in all its grandeur here. In a shocking development, there was one single advertisment in the avalanche of Black Friday gimmick sales spam currently suffocating my email inbox that is actually worth sharing with people of the history nerdly persuasion. I’ve written before about Exhibition on Screen productions, films capturing the background and execution of blockbuster art exhibitions. I’ve only had the opportunity to watch one of them on the big screen, but if I’d had my way, I would have watched them all. The distribution is just very limited is all. For one day only, ie, today, Friday, November 24th, every film in stock on their website is 50% off. Some of them are on DVD and only available in PAL format so they won’t work in most players in the US. Many of them are digital downloads which are a) easily viewed anywhere in the world, and b) cheap as hell. I’m limbering up my clickin’ finger because there’s going to be a lot of compensatory binging in my near future. I might be amenable to burning them as a stocking stuffers, but I make no guaratees. Painting the Modern Garden: Monet to Matisse, Michelangelo – Love and Death, The Impressionists and the Man Who Made Them, The Curious World of Hieronymus Bosch, Girl with a Pearl Earring – and other treasures from the Mauritshuis and Leonardo from the National Gallery London will all be mine. Oh yes. They will be mine. For less than $3.50 a pop. My one crushing disappointment is that their Domus Aurea documentary is out of stock. You would not believe how little material is out there about the recent restoration and new virtual reality exhibition of Nero’s Golden House. The site doesn’t have a bookstore and the general bookstore had diddly squat about the palace beyond a few cheesy pages in a tour book that didn’t even begin to touch on all the new archaeological information and technology. Any trouser-clad women in your old family photo albums? For those of you in who celebrate it, I hope you had a wonderful Thanksgiving full of good times, good food and only slightly deranged arguments that stopped well short of fisticuffs. I have family history on my mind today, thanks in large part to my father taking a moment before we gorged on a wide selection of fine viands to note that the house had been in our family for 106 years and Thanksgiving had been celebrated in it that whole time. His mother grew up there and even when she got married and had kids of her own, they always went to her parents’ house for TG. My father remembers fondly going every year as a child and youth when his grandmother hosted Thanksgiving dinner. Now that my parents live there, they have carried on the century-old tradition with great verve. Thanksgiving is my mother’s favorite holiday and they make a real production out of it every year. 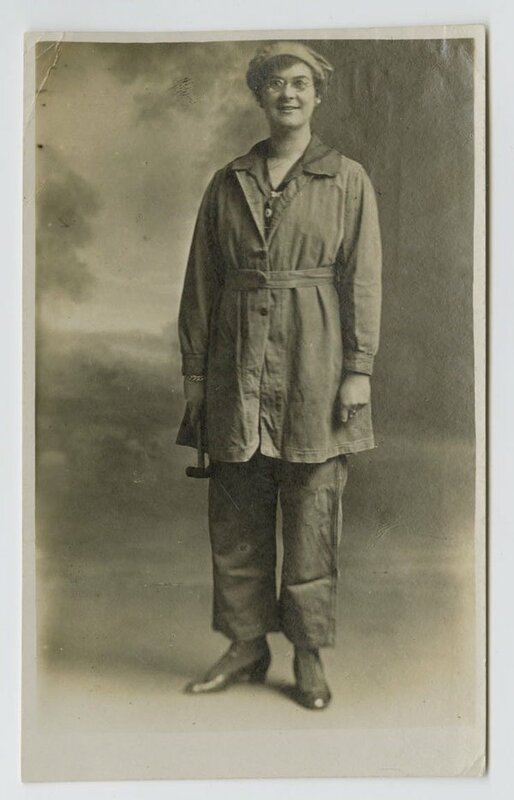 Family lore always make me happy, so before the tryptophan knocks me unconscious more thoroughly than any fisticuffs ever could, I feel compelled to encourage you to check out Women in Trousers: A Visual Archive, a Cardiff University project that is collecting and digitizing images of daring, hard-working, all-around badass women who wore a variety of transgressive bifurcated garments from bloomers to Edwardian trouser skirts where you barely tell there are trousers under there to wide-legged jeans from the 40s. 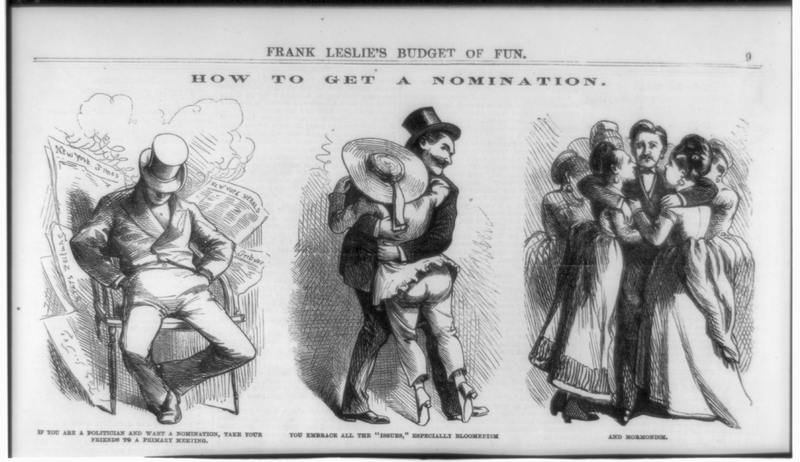 The archive is populated with all kinds of images — drawings, illustrations from periodicals, photographs of women on the job, advocating dress reform or simple in costume — from the mid-19th century to the 1960s. 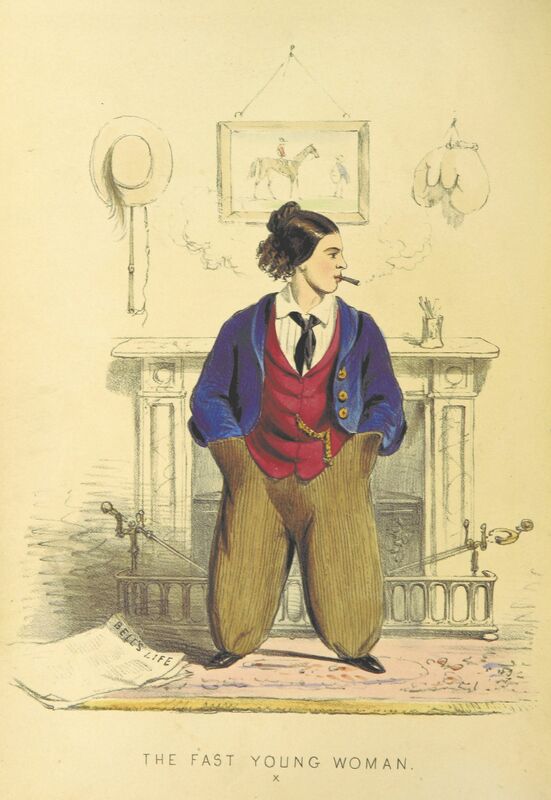 While the imagery focuses on the wearing of trousers, the project’s brief is a wider one: women’s social and political history and the evolution of dress reform in Britain, Europe and America. 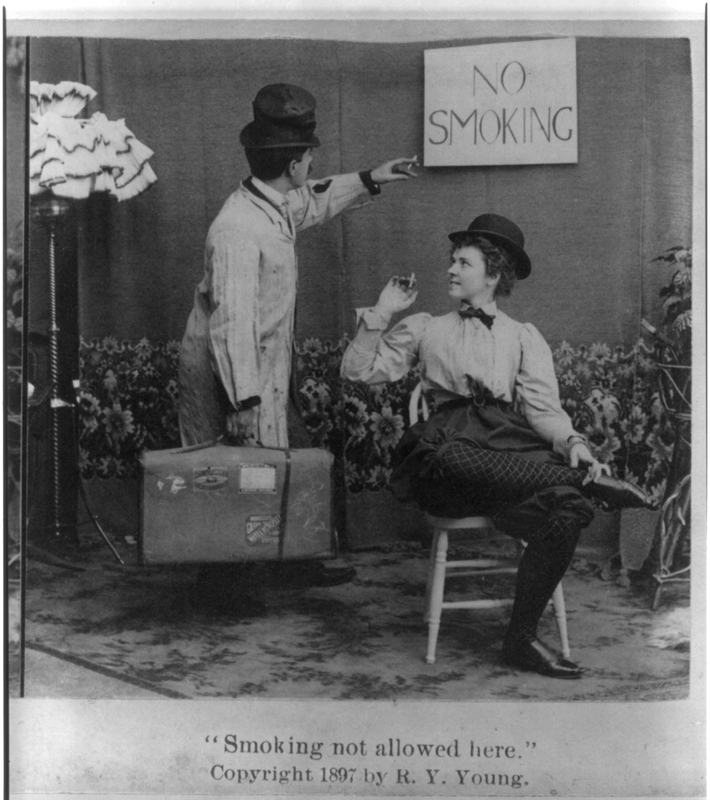 The archive is already a fantastic browse but it is still far from finished, and the authors have appealed to the public to submit any photographs and stories they might have of women in their families wearing pants. The ones that have been uploaded so far are universally grand. The Land Girls from WWII are probably my favorites because of how cheerful and tough they were, but I love the ones on ski trips, on the boardwalk and in plays just living their lives and having a blast. I’m going to go through my grandmother’s old black paper albums and look for a picture I remember seeing as a child of my great-grandmother — a Connecticut Yankee in the most authentic sense of the word who could shoot a rattlesnake through the eye from 100 yards, canned everything that wasn’t nailed down and used an outhouse until the very end of her long life. 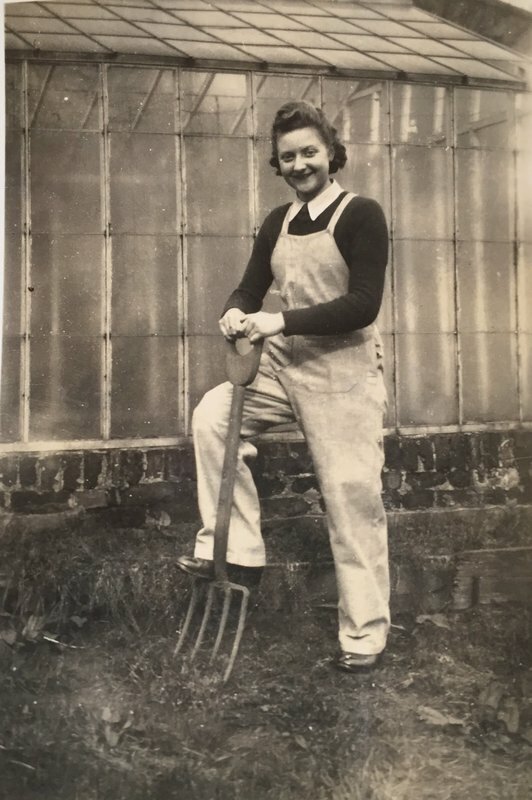 She was tough as nails but smiled constantly, always had a twinkle in her eye and a funny story for her great-grandkids. She also had a cast iron hand-pump that was the sole source of water inside the house. I was fascinated by it because it seemed like something in a play or on Little House on the Prairie, totally outside my experience and oh man the water was so, so cold. And rusty. She washed in it every day, bless her bulletproof hide. I hope I can find that pic of her wearing pants because I would love to add her distinctiveness to the archive. With the holidays coming up, now’s a great opportunity to rifle through dusty closets and drawers for photographic evidence of the kickass trouser-clad women in your family. It would be worth it just for the conversations that the pursuit might stimulate, especially with the senior members of your clan. 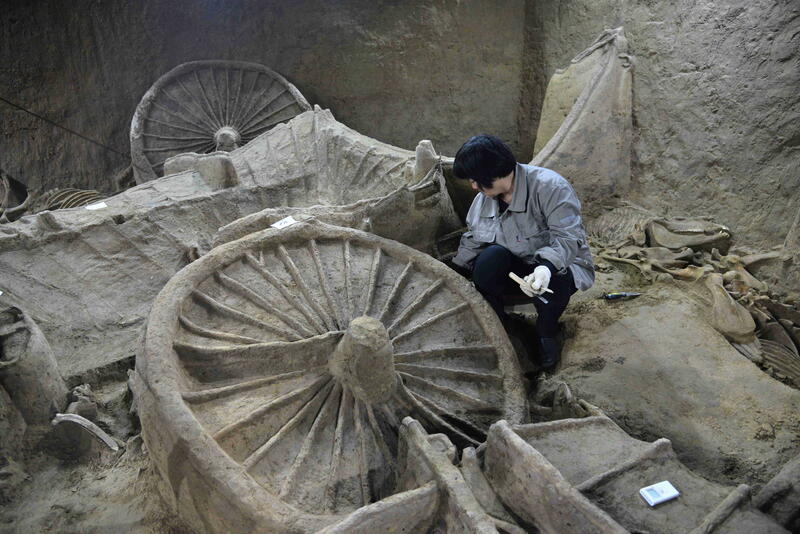 Archaeologists have found four ancient chariots and the remains of nearly 100 horses buried in a tomb in Xinzheng City, Henan province, central China. The chariots date to the Spring and Autumn Period (770-476 B.C.) and one of them in particular is an exceptional example of a luxurious vehicle with all the bells and whistles of the era. It’s huge, 2.56 meters (about 8’5″) long and 1.66 meters (about 5’5″) wide, and was elegantly appointed with bronze and bone decorations. The chariot has set a new record as the largest ancient horse-drawn vehicle discovered in Xinzheng City, which is saying something because more than 3,000 tombs have been unearthed in the area, including chariot and horse burials. The leader of the dig, Ma Juncai, told Xinhua that no written records have so far been uncovered at the site, making it unclear who the burial pit belonged to, but archaeologists think it likely to have been the funeral site for a Zheng lord. The site was first excavated in 2001. Two pits were revealed by the dig back then, but work was interrupted for 16 years until archaeologists were finally able to return to the location and pick up where they left off in February 2017. 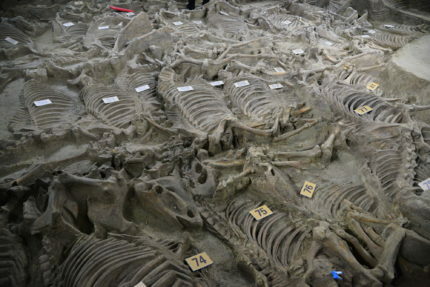 Over the nine months they’ve been excavating, archaeologists have unearthed the skeletal remains of more than 90 horses in addition to the four chariots. Pit 3 is the largest of the three tombs, and boy did they need the space. 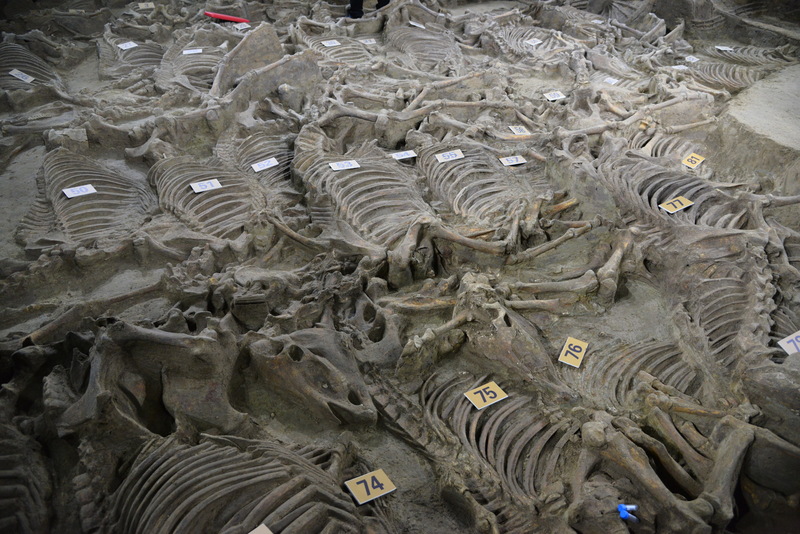 Dig leader and Henan Province Institute of Cultural Relics and Archeology archaeologist Ma Juncai estimates there are at least 100 horses buried here, but there could well be more. She believes there are more chariots yet to be unearthed as well. 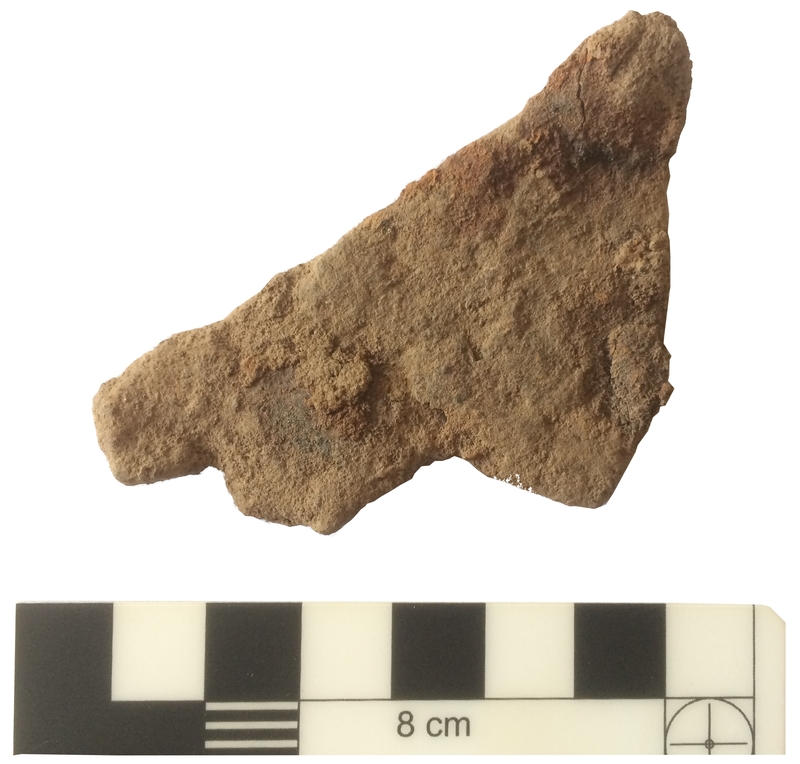 A number of bronze artifacts have also been discovered in Pit 3. 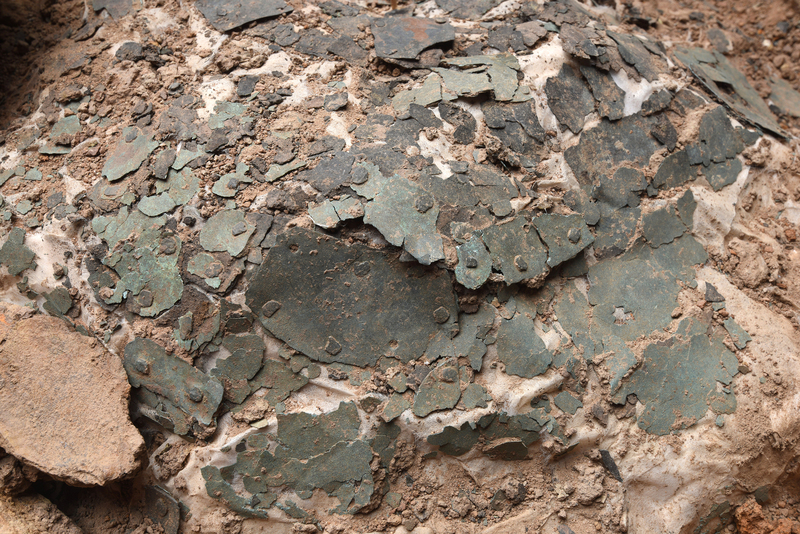 Archaeologists hope a thorough study of the bronze pieces will shed new light on the technological prowess and manufacturing methods of the period. They also hope the bronze artifacts might reveal more information about who was buried in the tomb, their social status and fill in some blanks about Zheng-era funerary practices. In a long, eventful life filled with accomplishments, John Quincy Adams often gets the credit for the one thing he didn’t do: being the first President of the United States to be photographed. That record goes to William Henry Harrison, poor sod, who had his picture taken around the time of his inauguration in 1841. Thirty-one days later, he was dead of a fever. (Legend has it he delivered his interminably long inaugural address without a coat thereby “catching cold” which developed into pneumonia and killed him. Now we know that the weather cannot infect you with disease — pathogenic microorganisms do that job — but it makes a good story so it has lingered as the dominant account of how the shortest presidential term of office came to such an abrupt end.) 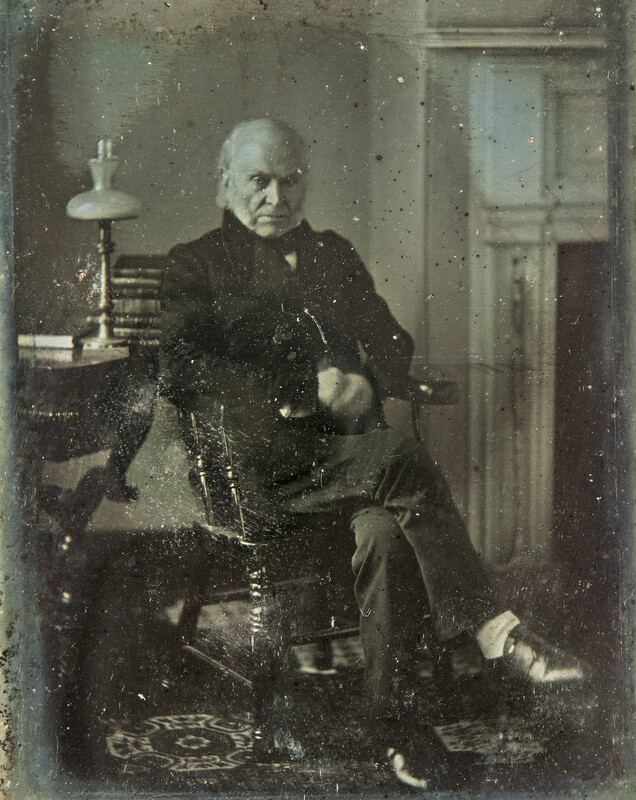 Adams was the second resident of the White House to photographed, albeit many years after his first and only term as President. 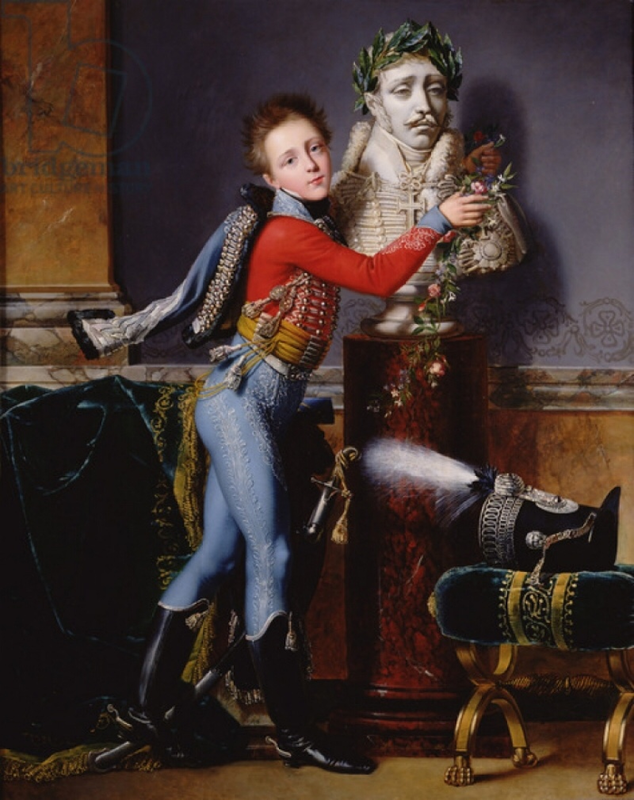 It was in 1842 and only reprints and copies of that image and the Harrison portrait are known to survive today. The originals are lost. That’s why there was so much excitement earlier this year when the news broke that an original daguerreotype of Adams taken by photographer Philip Haas at his studio in Washington, D.C. in 1843 emerged from the obscurity of attic clutter to the bright lights of Sotheby’s. It was the earliest known surviving original photographic portrait of a US president. 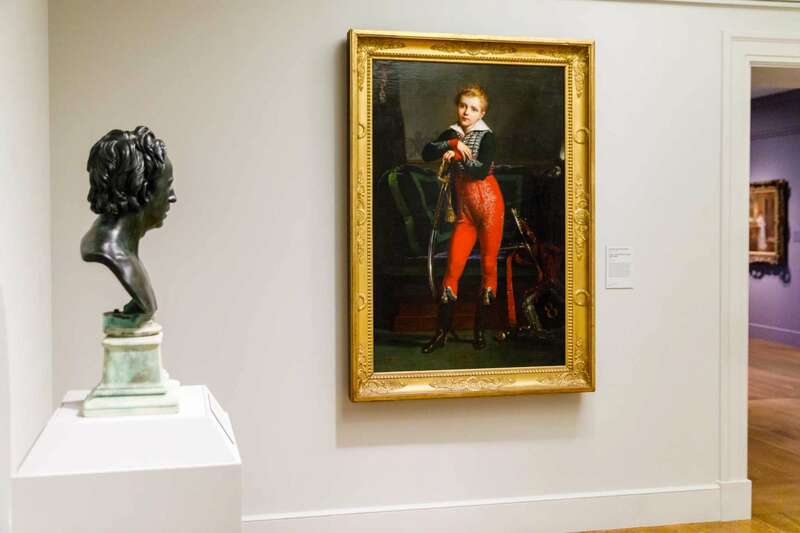 Bidding was not surprisingly fierce and there was much rejoicing in the history nerddom when the National Portrait Gallery announced a few days after the auction that they had placed the victorious bid. You wouldn’t know from how rare these original plates are, but as it turns out John Quincy Adams was a bit of a camera whore (said in reverent awe, Mr. President’s ghost, not disrespect). 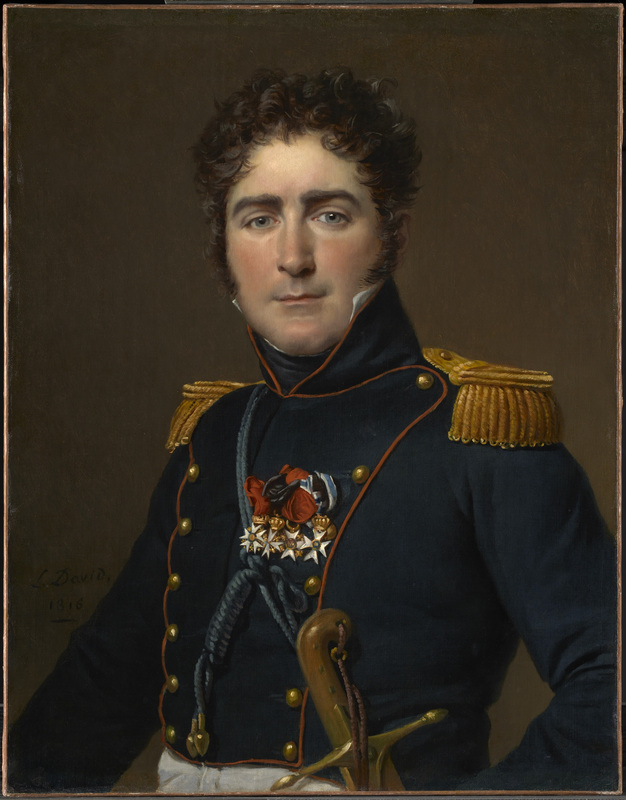 Louis Daguerre presented his new technology to the public in 1839, so when Adams sat for his first portrait in 1842, the process was still in its infancy. In March of 1843, he had another portrait taken, his first by Philip Haas. Then he went back Haas’ shop a week later to have the portrait redone because none of the ones from the first session came out right. His diary entries on those dates reveal his fascination with the “camera obscura” device and how it worked. The reference in Adams’ diary was the only evidence of the existence of the “quite successful” profile picture by John Plumbe. If it was published, printed, reproduced or in another way disseminated we don’t know about it. How is there a profile image of President John Quincy Adams published right here in this humble blog then, you boldly but fairly query? It’s not a print, reprint or a copy, though. (Okay it’s a digital copy. You know what I mean.) It’s the original plate shot and developed by Plumbe. 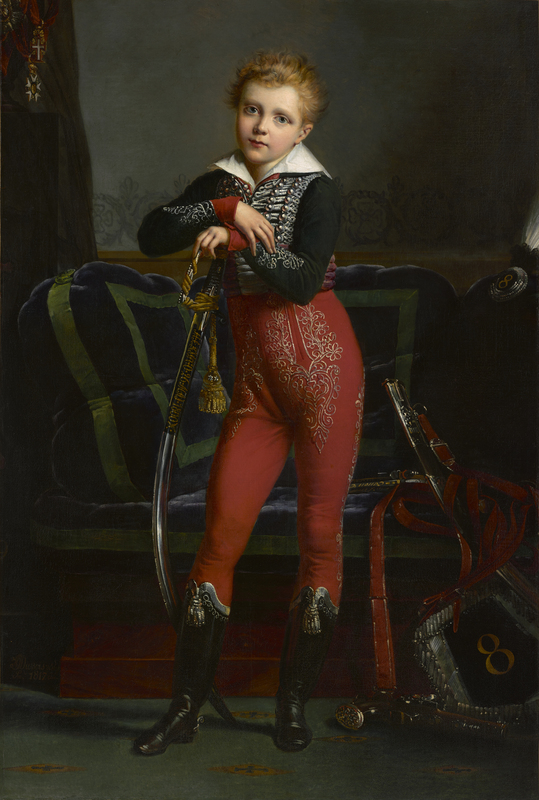 It just randomly turned up recently at a Paris antiques market, was spotted by someone with a good eye, got conserved, appraised and authenticated by top experts and it’s all over but the spending. 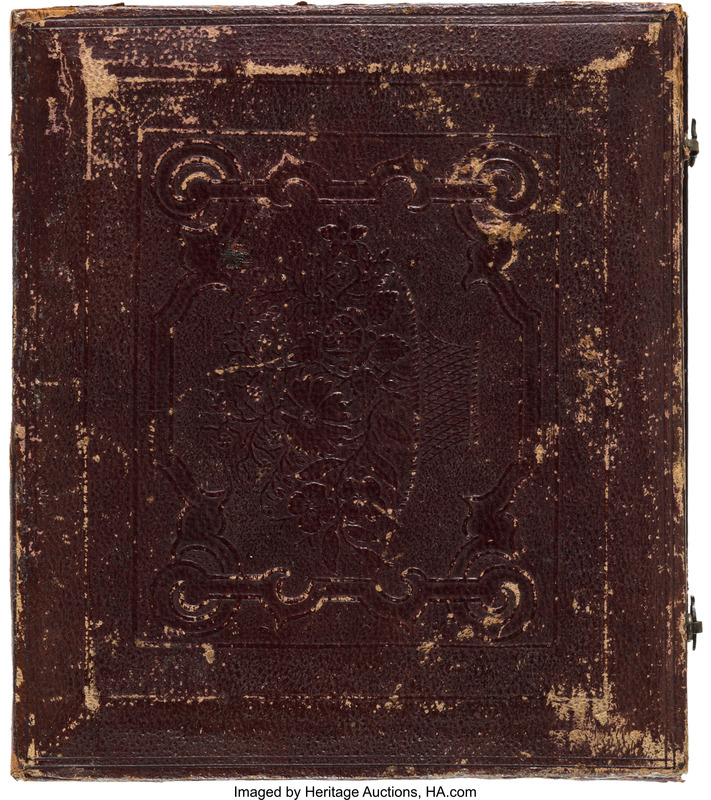 It’s a quarter plate Daguerreotype in a burgundy-glazed leather case lined with purple silk and velvet. 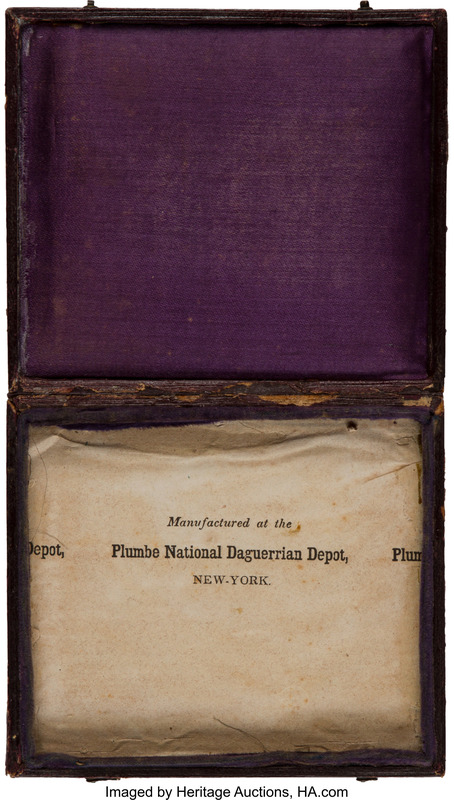 The brass matt is stamped “Plumbe” and cover of the case is embossed with a basket of flowers design that case was one of Plumbe’s signature motifs. The compartment that holds the plate has a paper liner that reads “Manufactured at the Plumbe National Daguerrian Depot, New York.” And the portrait itself is undeniably John Quincy Adams’ mutton-chopped mien in noble profile. 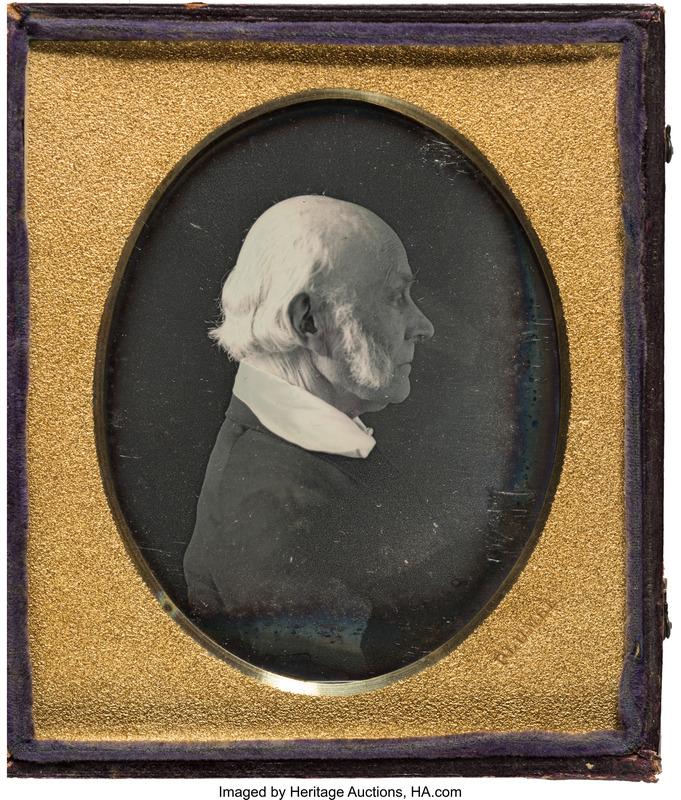 The 1846 Plumbe daguerreotype of John Quincy Adams will be offered at Heritage Auctions’ Americana sale on December 2nd with a pre-sale estimate of $50,000. HA has a strong web component; you can bid early online and the bids are already up to $25,000. 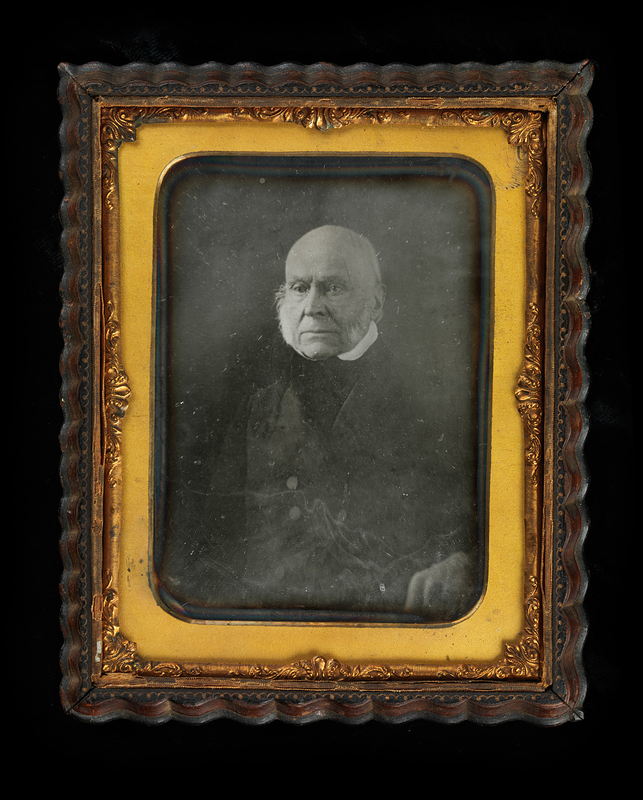 Given the results of the last auction where a John Quincy Adams portrait went far and beyond all pre-sale expectations, $50,000 could be surpassed within minutes.